Part of the Bluebella More DD+ range, the Timor bikini top offers you great support and shape without compromising on style. Designed in a high apex plunging shape, with lattice mesh strapping to the centre front to accentuate your bust. 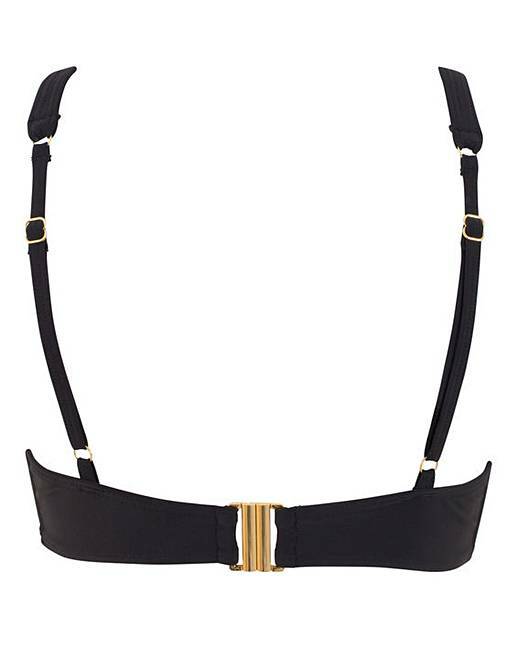 In a classic black with gold hardware detailing, underwired with centre back clasp fastening and adjustable straps for support. Pair with the Caspian bikini briefs to get heads turning at the beach! 89% Polyester, 11% Elastane. Mesh: 77% Nylon, 23% Elastane. Lining: Nylon (excluding trims).